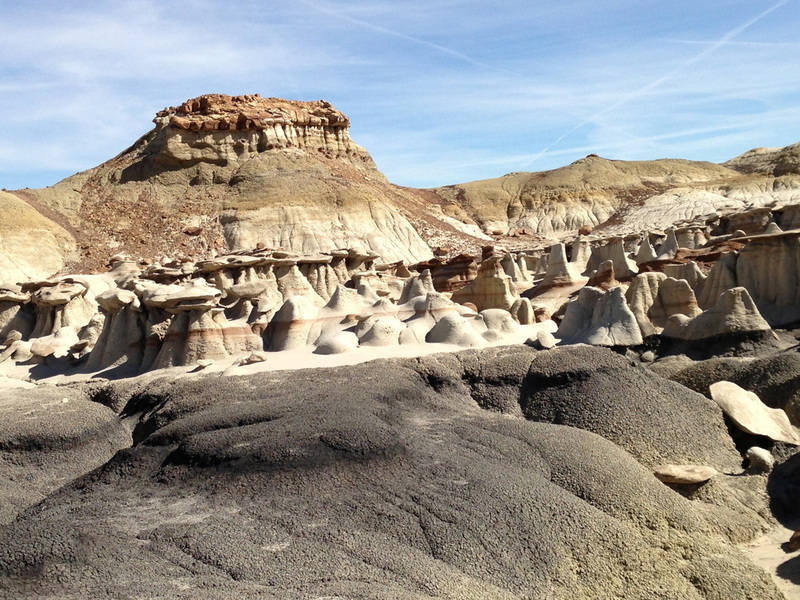 The entire landscape of the Bisti/De-Na-Zin Wilderness is formed by sedimentary deposits that were pushed up and then eroded away. The surrounding Colorado Plateau was formed in a long period of uplift, rising from sea level to almost 7,000 feet of elevation. 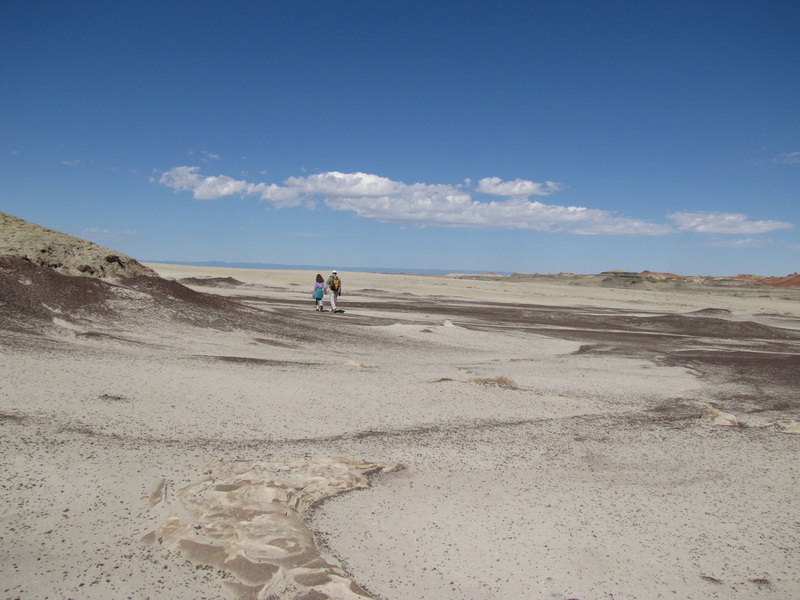 The uplift did not cause volcanic activity in the Bisti/De-Na-Zin Wilderness, as it did in the San Juan Mountains to the northeast. 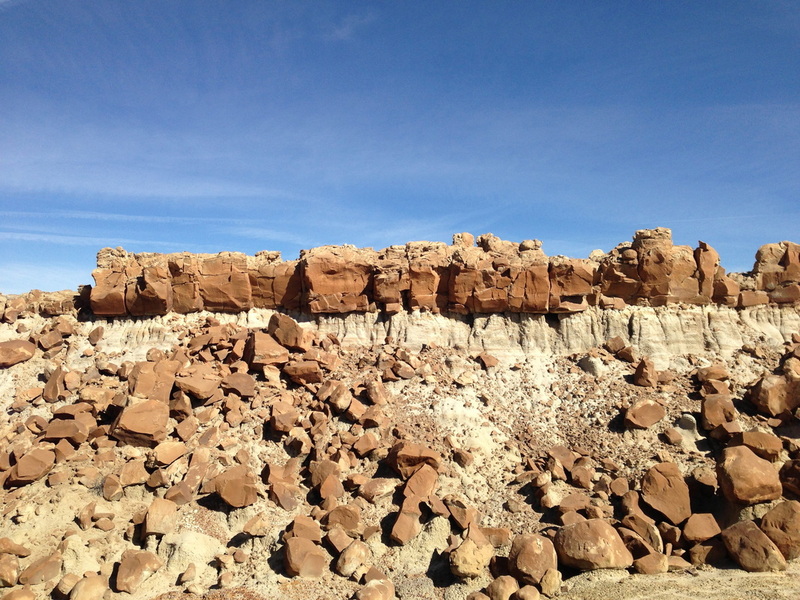 In the northwest corner of New Mexico, the Colorado Plateau was pushed upward as a block. You can experience something of the rise of the plateau as you drive from Albuquerque toward the Wilderness on Route 550. There are a number of exposed sedimentary layers on the eastern edge of the plateau. Keep an eye to the west of Rte. 550 as it winds up from about 5,000 feet of elevation at the Rio Grande in Bernalillo, to 7,300 feet at the Continental Divide, just north of Cuba. There are some striking bluffs just north of San Ysidro, at mile markers 34-35, that delineate the east edge of the Colorado Plateau. The high plains close to the Wilderness stand at 6,500 to 7,000 feet above sea level, then descend somewhat toward the badlands. The badlands themselves lie 100 to 200 feet below the immediately surrounding plains. De-Na-Zin Wash starts a bit above 6,300 feet near the eastern parking lot, and the low end of the wilderness badlands on the west (Bisti) end is just over 5,800 feet. 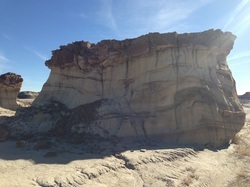 The picture above shows a view, looking from the bottom of the ash layer in Bisti, north toward the edge of the plains. The hoodoos' pillars are volcanic ash, set on lignite and shale. The highest point visible, top left, is a small, grassy mesa. The highest points in the Wilderness are always grassy table land (mesas). They are the pieces of the plain that did not erode and stand roughly even with each other. Even a few yards from the edge of these mesas within the Wilderness, the clay and lignite badlands lie far enough below that they are hidden. Standing on a high point in the Wilderness, you easily get the impression of simply standing on the high plains. Visible to the south are the mesa on which Pueblo Alto sits in Chaco Canyon NHP and (on a crisp clear day) , Mount Taylor near Albuquerque. This view strengthens one's understanding that everything below the grass has been carved away by wind and water. It is likely that glacial meltwater, flooding through this area at the end of the last Ice Age, carved the wide east-west gully in which the Wilderness lies today. After the glaciers receded, the landscape likely looked much as it does today. When this area was still underground, it was easy for water to find its way through the ashy layers. The water left behind deposits of lime and fine sediment that eventually built up into distributive channel sandstone. Anywhere that water ran atop a layer of ash, it left hard deposits. Subsequent erosion ate away the soft surrounding clay faster, except where it is protected by immediately overlying distributive channel sandstone. 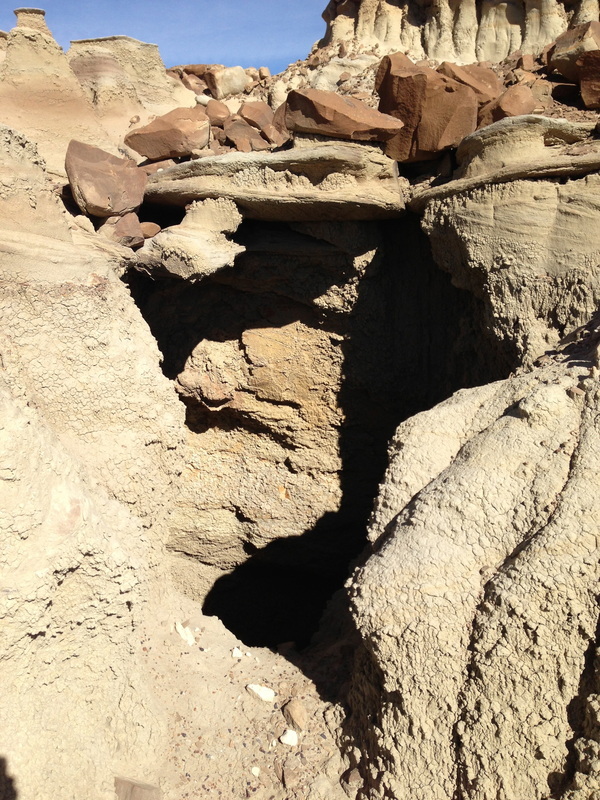 The sandstone became the "cap" of a hoodoo of ashy clay. 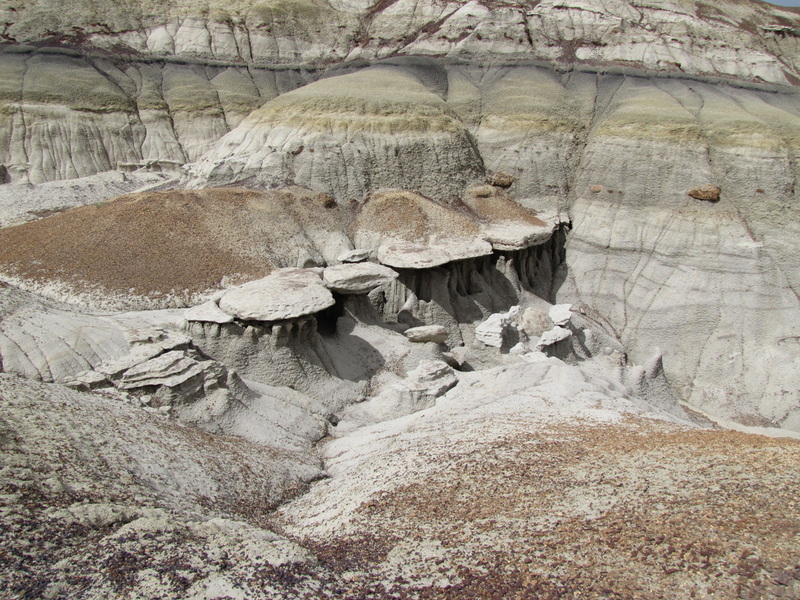 The caps of many of the all-gray hoodoos in the Bisti/De-Na-Zin wilderness (like those in the photo at left) result from this process. Sometimes the sedimentary process of water distribution caused tubes of limestone to form, which may be rounded and/or hollow still. The "eggs" of the Nursery (see Hike #1) are such limestone tubes, now lying on the floor of the wash. In another few hundred years, those eggs will probably be standing on ashy pedestals. It is natural to imagine that hoodoos "grow" but, to the contrary, they stand because everything softer around and below them was removed. Sometimes, in a high wind, you can see flecks of clay being removed from the edges of a pillar, as it grows microscopically narrower. On the De-Na-Zin side of the Wilderness, some large exposed limestone tubes still have hollow centers running through them. Hoodoos with distributive channel sandstone caps can be found anywhere, even above beds of lignite. The large flat piece of distributive channel sandstone, above, is still relatively intact. The ashy matter below is just beginning to be carved into pillars. Not all distributive channel sandstone fractures into caps on ashy pillars. The above sheet seems to hover over the clay. Another harder feature of the landscape is siltstone. Formed of fine particles in the river delta, it erodes more slowly than the coarser-grained sandstone (but tends to break apart in blocks, rather than form planes). It has a characteristic brown color that is richer than the surrounding tans. 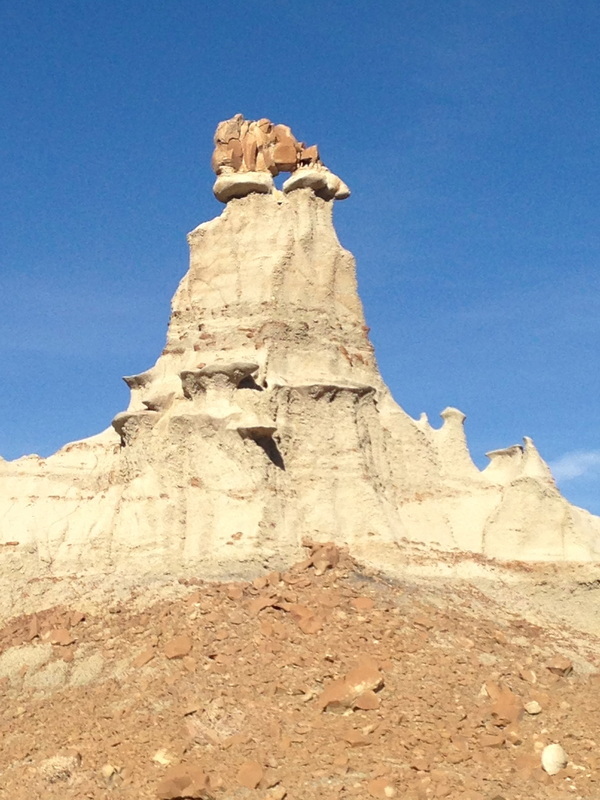 Many of the most impressive hoodoos, and the Bisti Arch, are capped with siltstone. Some of the best landmarks have rich brown caps that "stand proud" of the surrounding prominences. To the left is the center piece of the low north-south wall that divides the broad bottom of the Bisti end of the Wilderness, capped by a thick layer of siltstone. The wall is about fifteen feet high. A wider-angle view with perhaps better color is at the bottom of this page. 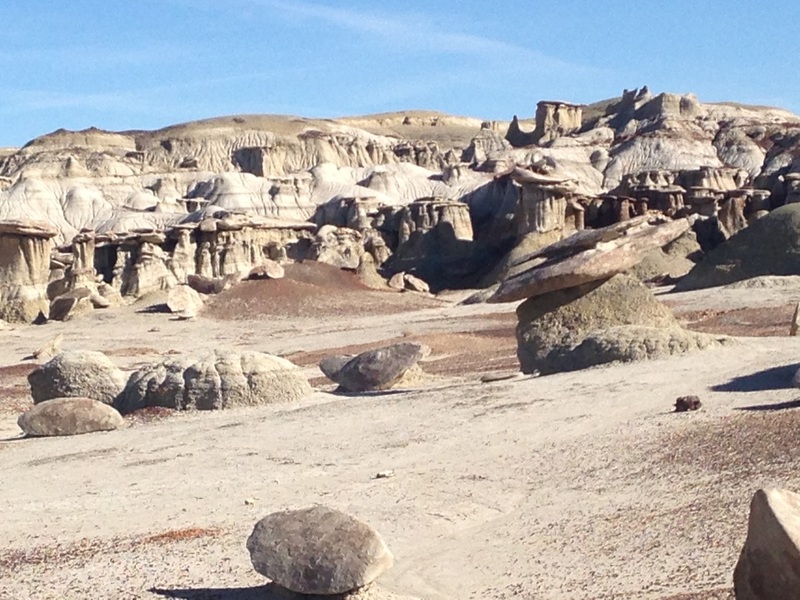 Above, siltstone caps sit on top of ash in the area WNW of the Bisti Arch. You can see how pillars will form as erosion continues to wash away the ash that is not protected by siltstone. To the right is the small piece of siltstone that caps the "Red Queen" at the southern entrance to Wonderland. The Red Queen is probably ten or twelve feet from the red clinker to the brown siltstone. 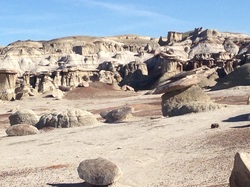 The glaciers of the last Ice Age deposited many small rounded stones at Bisti. 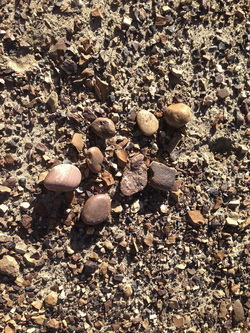 These are generally thumb-sized pebbles, although you will often see larger polished stones. Many are jasper and waxy in appearance, usually dull red or yellow. I collected a few together for this photo - they do not tend to aggregate, but rather get spread across flat areas. The BLM paleontologist told me that one can trace their origins back to specific sites around Silverton, Colorado. A few fossils also were polished by the glaciers. The central rock in this photo, the one that is least regular in shape, might be a fragment of fossilized turtle shell. It is too thin and polished for me to be certain (and I am no paleontologist). But such items are reasonably common in Bisti. The erosion can cause quite steep drop-offs, usually of only a few feet. Here, harder layers of gray sandstone or lime are bridging a hole in the wall. This one was unusually deep, probably ten feet. My iPhone camera is not sensitive enough to contrast to let you see that the area in shadow extends downward into the wall of ash. I do not recommend climbing into these, as they can collapse quite easily. Sometimes when you are walking on the ash you will see that the low saddle between two piles of ash is undermined by water passing through and leaving sinkholes. I try not to walk over those, although I have sometimes tried it without ill effect. As these photos show, much of Bisti is gray and open, a wide wash with some arroyos developing, with other, narrower washes to the north. To walk in from the parking lot to Wonderland through the middle of the bottom, you need to climb in and out of the arroyos a dozen times, but if you know the routes, you can walk on a level path for miles. 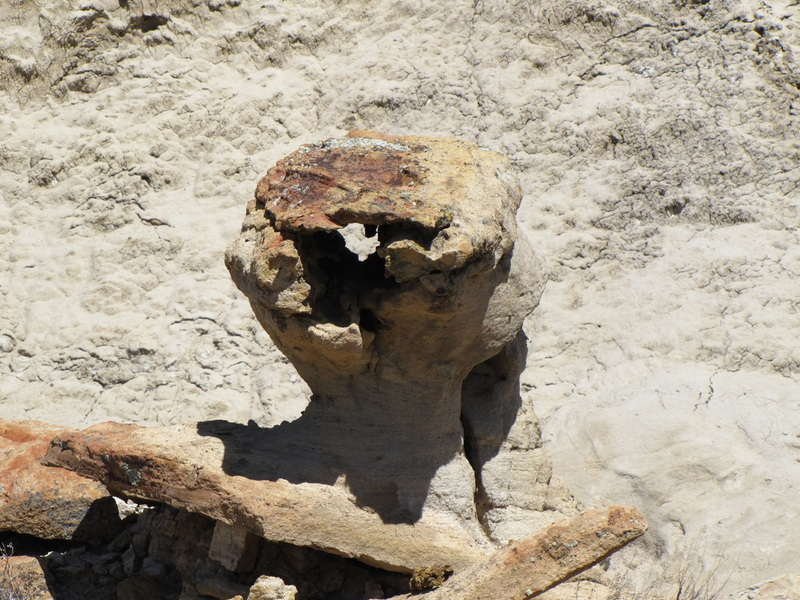 The photo on left shows one of the smaller wash areas north of the main one, with a large vertebra exposed on its floor. 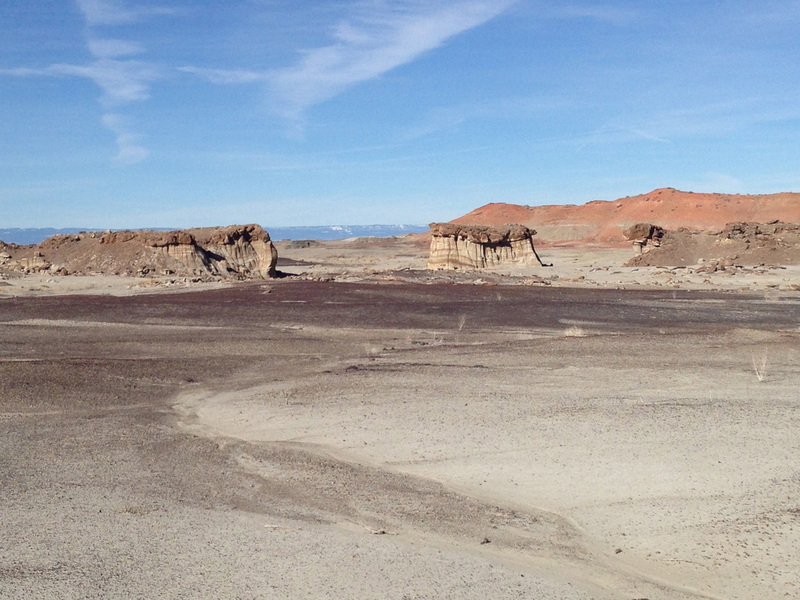 The first photograph below looks west along the bottom of Bisti toward the prominent siltstone wall and the Chuska Mountains (probably 2 1/2 miles east of the parking lots). The final photo, also aimed west, gives you more of a sense of how wide and low the Bisti area is. 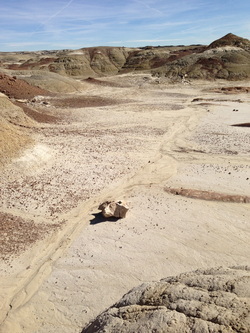 The right side of both big pictures below shows the clinker-covered rise that covers much of the northwest piece of Bisti. Buttons to navigate to other pages on this site are below the title and at the top of the page.